© 1990 Pablo Sosa, admin. GIA Publications, Inc.
and on earth peace to the people in whom God is well pleased. Pablo Sosa (b. 1933) grew up and was educated in Argentina, the U.S. (Westminster Choir College), and Germany. For years he pastored a large Methodist congregation in Buenos Aires, Argentina while composing songs, leading choirs, editing hymnals, producing religious broadcasts, and teaching liturgy and hymnology at a seminary. Whether in his home church, Iglesia Evangélica Metodista La Tercera (Third Methodist Church) in Buenos Aires, or at churches or conferences around the world, he urges people, “Put your body into worship!” And he reminds them of the biblical connection between justice and worship. This song was written for the children of Sosa’s congregation when they needed an angel song for their Christmas pageant. He composed it in the joyful cueca rhythm, with its playful alteration between 3/4 and 6/8. The song can be sung with no special accompaniment, but if you have even a small choir and a good pianist, treat them and the whole congregation to the joyful setting Sosa composed later for this song. 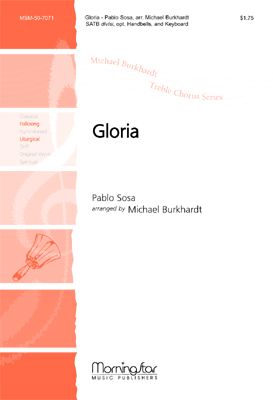 After the congregation is finished singing their part, the women of the choir (representing the angels) echo the “Gloria” three times in two parts (soprano and alto, skipping the C), each time getting softer (or dropping out voices) along with the rising piano part, as the angels disappear back into the heavenly places. When the children of his congregation in Argentia realized at the last minute that they didn’t have an “angel’s song” for their Christmas pagent, Pablo Sosa, an internationally known pastor, theologian, and composer, came to the rscue and wrote this song for them.